A perfect Valentine’s Day dessert! This year as I think of Valentine’s Day my heart fills with joy. What is more beautiful than simply love? Whether it’s love for your spouse, from God, for God or to a friend or a hurting person, what really is more motivating and comforting than love? Realistically, we all know that true love isn’t just dropped from the sky and living happily ever after! Love is something that fascinates me. Whether it’s an older grandpa taking his wife to the grocery store or memories of our courting days when I felt like a queen just to be Daniel’s best friend, love is intriguing and powerful. As I think back to Daniel and my courtship days, I can’t help but just smile at how I used to think that it would be boring to have been married for five or ten years. Well yes, things do change, it’s not all new like it was at first. But it’s not a monotonous life. Neither is it boring. The ups and downs of life had brought us closer than we were on that incredible day when I was joined to Daniel to be his for the rest of my life. I’m not going to tell you though, that I always just felt these rosy feelings bubbling on the inside. There have been deep waters to wade. Life has brought changes, adjustments and responsibilities resulting in both of us trying to find our place in each other’s life. As you can imagine, with three little ones being added to our home in four months, Daniel and I don’t have the time with one another as we used to. As you know, those rough spots have a way of turning into good when God gets hold of them. Today I feel incredibly blessed to be a team with my best friend, caring for these precious children we would never trade for anything in the world. I was impressed recently when I read how a husband really needs to feel like he is primary in your life even if you have little ones to care for. “How really can this be done?” I wondered. While I don’t have all the answers, I love watching what happens when Daniel feels like he really does have top priority in my life. Okay, I don’t ever want to neglect my children or have them feel pushed back in any way, it’s just that if I keep God first and honor my husband, a whole bunch of other things just fall into place. I have found that there are also many ways that children can be involved in doing things for Daddy. Yesterday afternoon is an example. He was in a meeting, then a little before supper time, the children helped me set the table with pretty dishes, put on a table cloth, and used a candle and a bowl with punch and fruit as our centerpieces. It wasn’t anything way out, just enough to show that we love him and appreciate who he is in our lives and all he does. It is so thrilling for me to see our little ones develop a bond and relationship with their daddy, my husband. Now in case you’re thinking this all sounds too good or unrealistic, may I hasten to add that all this hasn’t happened overnight. In a sense, it seems like we just have fewer answers than ever and find ourselves calling on God more to keep connections and relationships in perspective. Many times I have had to think what an older lady, who I have come to appreciate deeply, once said, “If you feel like you deserve something from your husband, you are thinking wrong. We don’t deserve anything. All good things are gifts.” Hmmm… this really has gotten my attention more than once. I needed to hear it. Love and affection, and even romance simply have to take the back seat when we start thinking about ourselves and what we really think we need and deserve. As a paradox as it may seem, for me, the richest and enjoyable times in our marriage are those where I just surrender my ideas and will to God and trust Daniel to make any decisions at hand. The opposite of trying to have things go my way never fails to leave me exhausted and worried. A quick side note to all those of you who may be longing to experience love from a partner or special friend and don’t have this opportunity for whatever reason, I encourage you to tell God just how you feel and invite him to show you his love for you as an individual. He cares. Now, how about winding up with Valentines Ooe-y Gooey Chocolate Dessert? Cake mixes and instant puddings are convenience foods I rarely use, how about splurging for Valentine’s Day? egg, mix well. Press into a greased 9 by 13 cake pan. Bake at 350 for 15-18 minutes or until set. until set. In a bowl whisk together milk and both puddings. Let stand for 5 minutes or until slightly thickened. Spread over cream cheese mixture. Top with 3 cups whipped topping. Sprinkle with chocolate shavings. Refrigerate at least 2 hours before serving. Delicious served with ice cream. 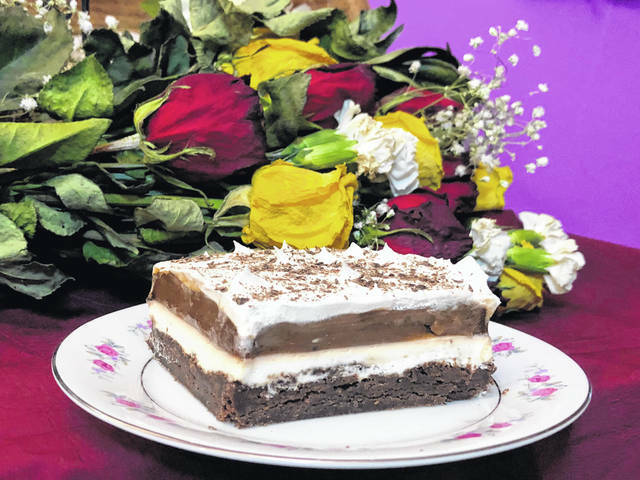 https://www.recordherald.com/wp-content/uploads/sites/27/2019/01/web1_gooey.jpgA perfect Valentine’s Day dessert!